Rob was born and bred on the South Wales coast, in the Vale of Glamorgan. He spent his youth playing rugby and surfing, before turning his attentions to veterinary medicine. After A-levels he worked as a nurse in a local practice, before securing a place at the University of Bristol. At university he continued to play rugby and was selected to be a year representative. Rob qualified in 2001 and returned to his local practice. In 2005, Rob took a year out to travel. He backpacked through Asia, New Zealand, Australia and Fiji, as well as working as a vet in Australia. Rob started work at Valley Vets in 2006 and became a Director and owner in 2009. He is the Senior Vet at our Cardiff Hospital. Rob gained a GPCert and Post Graduate Certificate in Small Animal Surgery in 2014. His main interest is surgery, in particular orthopaedics and dentistry. 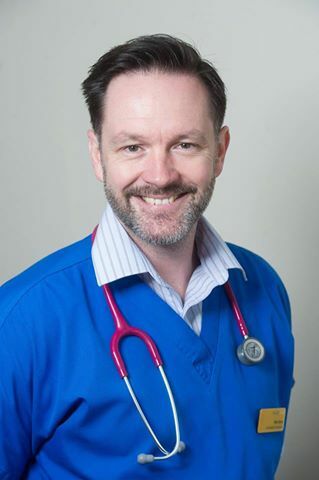 Our clients have nominated Rob for the annual Vet of the Year award on a number of occasions. Rob is a keen fly fisherman and ties all his own flies. He also plays golf and has a single figure handicap. He is an avid F1 fan, the highlight being a pit-lane tour in 2010, where he was shown around the McLaren garage. He has a young family and is looking forward to a full night sleep and being able to watch a Grand Prix from start to finish.